Moist environments provide the perfect breeding ground for bacteria and during the menstrual cycle, women are vulnerable to inflammation or infection without proper care. According to doctors in obstetrics and gynaecology, some women suffer from gynaecologic diseases due to the improper use of sanitary products. Indeed the World Health Organisation claims that 63% of gynecologic diseases are caused by using poor quality sanitary products as women are vulnerable to infection during this delicate period and weakened immunity can lead to more serious health threats. It is suggested that sanitary towels with cotton surfaces are preferable because they’re more absorbent and comfortable. Scented towels or synthetic material should be avoided. Towels should be replaced regularly during periods to help prevent bacterial growth. 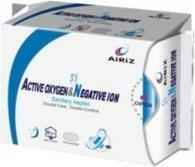 AIRIZ Oxygen and Negative Ion sanitary towels combine active oxygen and anion to help prevent harmful bacteria and protect helpful bacteria. The towels contain no drugs or chemical composition. • 8 Layers of Protection. • Reduces fatigue and strengths Immunity. • Eradicates odor and promotes metabolism. • Dry, air permeable, anti-leakage.